This recipe has been on the site for years. And for about the same amount of time, I’ve felt like I needed to give it better photos. Making pasta at home doesn’t have to be hard. In fact, I believe it’s one of those items that after you make it a few times, it becomes easy. It might take a few tries to get the feel of the dough right. But once you do, it’s fresh pasta whenever you want. And trust me, the flavor is so much better (or I should say, there is a flavor!). You don’t really need fancy tools to make pasta. But I love having an attachment for my stand mixer and a pasta drying rack. Or, if you don’t have a stand mixer, you can always try out a pasta machine. 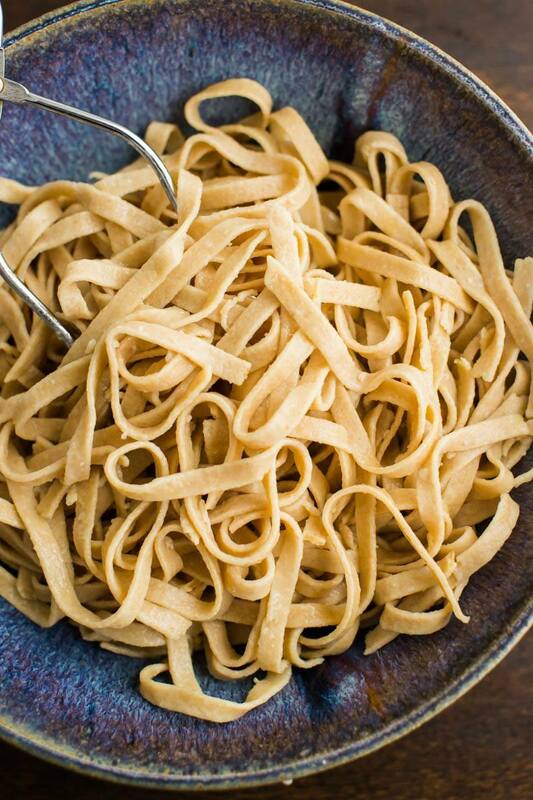 Step away from buying store-bought pasta with this easy homemade whole wheat pasta. This pasta can be made with or without a pasta maker and is ready in about 45 minutes! Combine the whole wheat flour and salt on a clean, flat surface. Make a well in the middle, crack the eggs into the welll. Using a fork, whisk eggs and slowly begin to incorporate the flour. Keep mixing and once the dough starts to form, switch to your hands and knead the dough until the dough is smooth and no longer sticky (but not stiff). The dough should spring back when pressed. Form into a disk , cover with a damp towel, and let rest for 30 minutes. Divide the dough into 8 pieces. Working with one piece at a time, flatten the dough with your hands. Making sure the dough is covered with flour, use an electric or hand crank (see note) and roll the dough into thin sheets. If using a machine, check instructions for desired thickness. Continue to make the noodles by using the fettuccine attachment or cut into 1/4-inch wide strips with a knife or pizza cutter. Hang noodles for drying if desired and repeat with remaining dough. Bring a large pot of salted water to a boil and add noodles. Cook until the noodles float to the top and are tender, 4 to 5 minutes. Drain noodles, transfer to a bowl, and toss with a drizzle of olive oil. You can make pasta without an attachment, use a rolling pin to flatten into thin sheets. You want a dough that is not sticky but also not too stiff. The more I make this dough, the more I realized I needed to add more flour. If you’re hand rolling, you can do without the extra flour but for machines, the dough cannot have any stick to it. This is especially true if you’re using an attachment to make macaroni or rigatoni. I’ve had to go up to 2 1/2 to 2 3/4 cup of flour to insure the right pasta consistency. Go by feel, test a bit of dough and if it sticks, add more flour. This whole wheat pasta recipe is really my one and only. In fact, any time I make pasta, it’s this recipe. From there, I can doctor it up as I desire. I usually find myself adding black pepper but you can really play with the flavors. However, this pasta is great as is, just the simple whole wheat pasta has a nice flavor. You can also try your hand at a Semolina (vegan) version or a gluten-free version as well. Add-ins: This recipe serves as a great base. However, I love to add fresh herbs into the pasta, a hefty scoop of black pepper, or even cooked spinach. Flours: I usually stick with white whole wheat flour but einkorn, spelt, or farro flour work as well (einkorn makes wonderful pasta). Also, regular whole wheat flour will work as well- I just find the white whole wheat a bit easier to work with. Play with shapes: this pasta is perfect for ravioli, long noodles, and even short noodles. You don’t need special tools because ravioli, long noodles, and even some short noodles are easily made by hand. Recipe originally published on April 26th, 2010. Last updated on November 8th, 2015. The pasta looks fantastic!! I need to make some pasta this week. 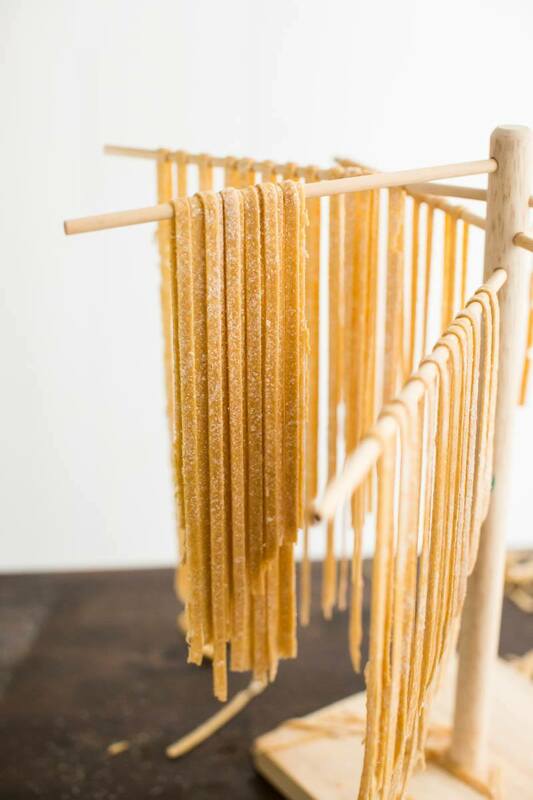 Beautiful photography of the pasta making process! I think I definitely need the pasta attachment to my kitchenaid now! I love my kitchen aid attachment and would highly recommend it! Thank you for such a great recipe. Sometimes it’s too easy to go with white pasta. I definitely want to try this. I think it does! It definitely has different taste and texture but I think it adds to the meal! will this dough go through the macaroni/spaghetti attachement? I don’t have the flat attachment. Hi Mary, Apologies for the delay. If you can roll it out thin enough, you might be okay. I use the flat attachment to knead and flatten the down into wide noodles and then after that I run it through the spaghetti attachment. Can’t wait to try this recipe! I was wondering, how long would the pasta last after you dry it out? Like, how long can I keep it before I use it? I’ve never really tried to keep pasta- I always use it fresh right after making. But from what I’ve read, several months as long as the pasta is completely dried. 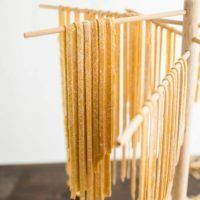 I’ve also been a bit paranoid about homemade pasta with eggs but Fine Cooking has a quick overview on that (http://www.finecooking.com/item/11717/dried-egg-pasta-hidden-danger-or-perfectly-safe). I’ve made homemade dumling style pasta many times but I’ve never tried doing it all perfect and beautiful with a pasta machine. Thanks for inspiring me to try this! Amazing! I’ve been eating store bought whole wheat pasta for such a long time but I suspect that I’m seriously missing out on the real deal! Homemade pasta. It sounds amazing. I have never made my own pasta but I think I will try this. I’ve always fretted about my counter being clean enough, or having a board that as big enough, and then I see that you just put down what looks like parchment? Mind blown. I have actually never considered this before. Just what I was looking for! I want to get back in to making pasta. I never really dried it though, in the past. How long does one dry it for? I’ve always used it fresh but The Kitchn has good info on drying it and I agree with some of the commenters- I let it dry until I’m done making it, toss it with flour, and then freeze it. I’ve never stored it at room temperature because of the raw egg! using whole wheat always causes it to fall to bits when I try to roll it through. I haven’t gotten the knack of it after many tries. I need help!!! any tips for me? I’ve found the white wheat works better than the hearty/grainy brown wheat and I’ve also found a bit of extra moisture helps- you don’t want the dough to be stiff. Just add enough flour for it to not be sticky because you can always add more if needed. Hope that helps! I tried this recipe to make lasagna noodles and it worked like a charm! Now I was wondering how much spinach you add to the recipe? And do you alter anything else? PS: The site wouldn’t let me give you 5 stars for the recipe? I would have done so otherwise! I’m using Chrome. Thanks for the recipe! It’s so easy and delicious! PS: It just let me give you 5 stars. No clue. But now it works..? I want to make home made pasta. I have kitchen aid stand mixer. Problem is we are total vegetarian,we don’t consume eggs. Is there an alternative for eggs? Thanks. Do you just put the dampened towel directly on the dough or you put the dough on a bowl then cover it? I just put it over the dough. This worked perfectly! I left the Salt out of the dough, as I’ve heard this can lead to tough cooked pasta (I heavily salt the boiling water instead for flavor). I’m glad I looked for a recipe for whole wheat flour! I’ll be using this more than all purpose flour. Next up: semolina. Hi, I have a question: How much olive oil do you use while making the dough? I mean when you make the well and whisk the eggs with olive oil? I couldn’t find it in the recipe. Hi Ally- sorry about that. I recently updated the recipe and removed the olive oil- I found I didn’t need it in the dough. I’ve updated the instructions to reflect! Oh, I see 🙂 It’s totally okay and thanks for the quick reply! Mine is resting right now, I measured the flour on my scale … and wound up having to put in an extra egg ? Of course I don’t know what I’m doing or what too stiff or bouncing back means ? so we shall see ?? The recipe misstates the weight of the flour. One cup of flour weighs 128g. So 2.25 cups is 288 grams, not 315. I used the 315g stated in the recipe and like you had to add an egg, plus some more flour. With 4 eggs, the ratio would suggest using 384g. I’m new at making pasta. I just got a mill to make my own flour and going to give this recipe a whirl! My question: Do you know if there is an adjustment for high altitude? 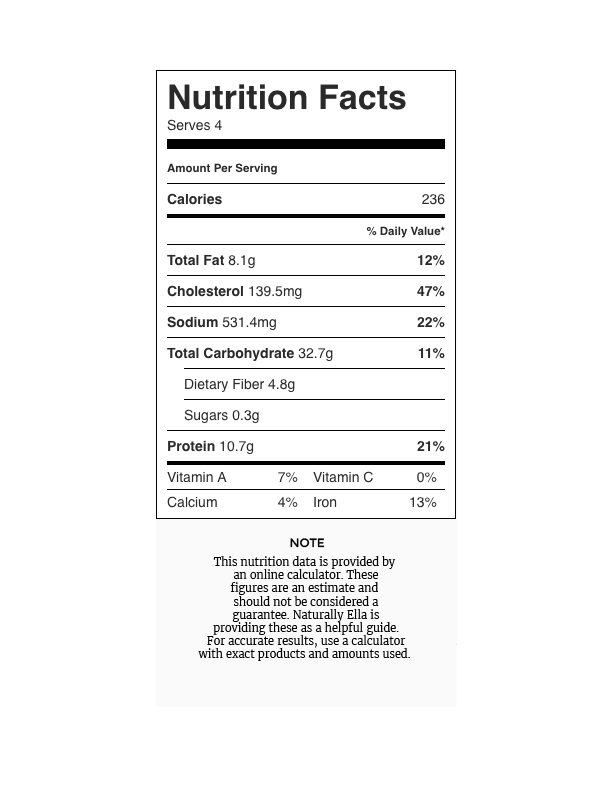 More egg, less flour? Happy cooking all! You might need extra egg or egg yolk-the key is moisture. Are you going to use a pasta roller or roll by hand? I’ve found with some pasta tools (like a kitchen aid attachment) the dough needs to be tough- so it would be a balance between moisture and non-stickiness. This is absolutely delicious and will be my go-to recipe going forward. I used a scale to measure the flour and had to add water in order to incorporate all of the flour, but after an initial panic it turned out great! Next time I’ll try slightly reducing the flour added at the beginning. Thanks for the recipe! Thank you so much for basically starting with the recipe and not making readers scroll down 5 pages filled with stuff nobody needs to know (like WAY too many food bloggers). This is a solid recipe with good ideas and I really enjoyed making it.